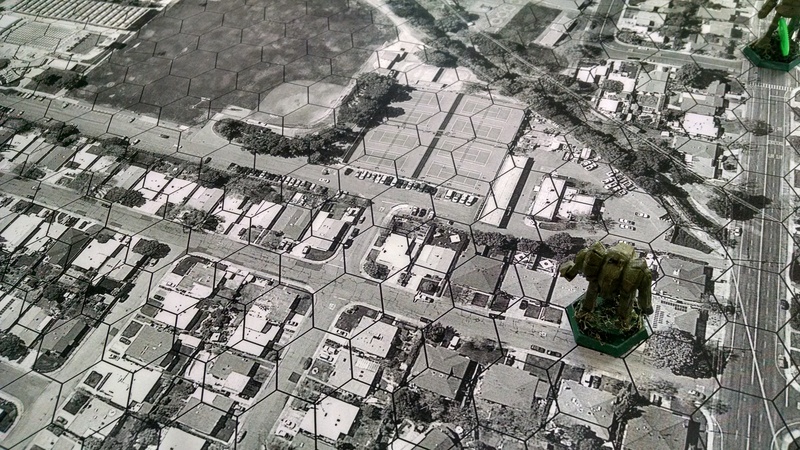 For the BattleTech game I hosted last weekend, I thought it’d be fun to stomp around our neighbourhood. And it was fun! It was also delightfully easy. It’s amazing what we have at our fingertips these days. I fired up Google Earth, found a spot, and in very short order had us a map to play on. Admittedly, having access to a plotter was super convenient, but Kinkos or blueprinting houses also make it pretty easy to get large-format stuff printed. Here is the map if you’d like to use it in your own game. The first link is with the hexes, the second without. In the future, I think we’ll go without the hexes – for a “real world” thing like this not everything fit well in the hexes and we had to do some fudging to make it playable, so not having the hexes and using full mini rules would’ve been about as easy. Be sure to download — the preview makes the hexes look positively uber thick. Enjoy!